Death? Yes, yes, death hovers near us all. And it is sad that it makes us sad. But I know a story. Such is the life of Ambrose Zephyr. At 50 years of age, Ambrose is diagnosed with a fatal but unidentifiable illness -- an illness that, within 30 day's time, will leave him dead. Yes, the doctor offered, writes Richardson, unfair would be a very good word about now. Zephyr's soon and imminent death, however, makes up only one element to this story. Meet Zappora Ashkenazi, more commonly known as Zipper. A literary editor for the third-most read fashion magazine, brilliant cook, reads everything, has impeccable fashion sense, but most of all, Zipper is the loyal and loving wife to the Ambrose Zephyr. With the distinct absence of children, the couple dedicate more time fulfilling their careers and living "contentedly" together "in a narrow London terrace full of books." What happens, then, when a couple create an ideal life together -- a union in which needs are met by each other and through their work -- once the other is gone? Contentment shatters, and Zipper must cope with the facts. In a month, she will be alone; no husband and no children. And what will I have when he's gone? Nothing. No growing ancient together, no retiring to the pied-à-terre, no children, no grandchildren, come to that. No more. No life. Nothing. Blank. But you never wanted children, Kitts said. I never wanted this. I is for I don't know what to do. Zippper, feeling a deep sadness, anticipates Ambrose's loss and examines life choices -- likely regretting that she never had a child -- while wishing not to let go. If one extends time from days to weeks to decades, it will still come short, as there is little time to live in comparison to how much life could be experienced. As Zipper feels torn between wanting to make the most out of limited days but wishing those days were not limited, Ambrose faces his own death and what he never accomplished in life. What is a couple to do? Indeed, said the doctor. Arrangements. Ambrose Zephyr suggested, for all in the outer office to hear, that the doctor might want to wait one damn minute before suggesting that Ambrose might want to arrange his remaining days. Days that until moments before had been assumed would stretch to years. With luck, to decades. Not shrink to weeks. As such, husband and wife agree on a rash decision to travel the world, but perhaps not in the way one might think -- and certainly not in the way Ambrose initially planned. Ambrose Zephyr and Zappora Ashkenazi: A.Z. & Z.A. From the beginning to the end of the alphabet and back again. In under 200 pages (depending on the copy; mine meets 119), the couple's adventures and turmoil could have been wrung out, extended, and glossed in rich detail inside a 300-500 page novel instead. Yet the swiftness is rather appropriate, and, as I find it, where the appeal rests. Hand a person generations of time, and he will still wish for more. There is difficulty in saying goodbye and accepting what is in order to let go, to release the grip on something that was expected to last or taken for granted. In fluid, conversational tone, Richardson's charm sits in the vast scope of story-telling accomplished through brevity. Not overtly sentimental, Richardson manages to pack in enough pow and flair that, through the power of simplicity, captivates intrigue and grasps emotions. 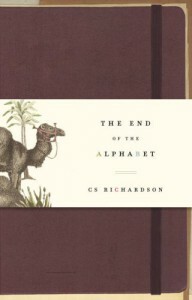 Both nimble and discerning, The End of the Alphabet is tale about love and life I recommend anyone journey. "An alphabet of the language of lovers, a beautiful fable of art and mortality: elegant, wise, and humane. 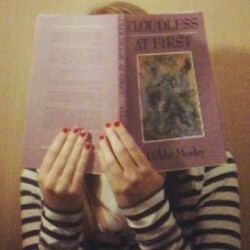 I like to think of the happiness this book will bring. I'm sure it will be given as a gift between lovers, and will inspire many journeys -- geographical and emotional."